The annual development cycle of boreal and temperate trees results from an evolutionary trade-off between two opposing forces. These are namely, the adjustment of leaf phenology to the timing of frost occurrence at the beginning and/or the end of the growth season countered by an effective adjustment to the duration of the growth season to maximise photosynthesis and biomass production during the growing season. In a provenance trial of common beech (Fagus sylvatica L.) populations, we tested whether avoiding frost events by late flushing is the primary process of frost tolerance, and also, whether longer growth seasons resulted in an increase in biomass production. We detected clines with altitude and longitude of provenances for phenological traits, in contrast to growth variables. A highly significant negative genetic correlation was detected between frost damage and budburst date which confirms that the timing of leaf flushing is the principal determinant of tolerance to late frost. Height and diameter growth were positively correlated with the length of the vegetation season. However, this effect was associated with the timing of growth cessation rather than with budburst. Stabilizing selection, selective pressure on early leaf flushing of juveniles in dense natural beech stands, and epigenetic regulation of budburst are proposed as explanations for these observations. The online version of this article (doi: 10.1007/s13595-011-0103-1) contains supplementary material, which is available to authorized users. The provenance trial has been established through the realisation of the project European Network for the Evaluation of the Genetic Resources of Beech for Appropriate Use in Sustainable Forestry Management (Contract AIR3-CT94-2091) under the coordination of H.-J. Muhs and G. von Wuehlisch. 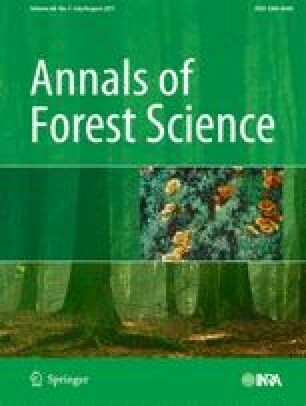 Collection of field data was accomplished within the COST Action E52 Evaluation of Beech Genetic Resources for Sustainable Forestry. The study was supported by a grant of the Slovak Agency for Research and Development no. APVV-0441-07. The assistance of D. Krajmerová, I. Romšaková, G. Baloghová and H. Parobková with height and diameter measurements is highly appreciated. Weather data for the station Kráľová were kindly provided by K. Střelcová. We also wish to thank to D. Pauleová, E. Ritch-Krc and P. Svihra for language correction.